The discovery of white-nose syndrome in three new Illinois counties has brought the total to seven new affected counties in the state this year. The disease was first discovered in Illinois in 2013 in Hardin, LaSalle, Monroe and Pope Counties. Then earlier this year, bats that tested positive for the disease were found in Union, Saline, Johnson, and Jackson Counties. These latest additions, in Adams, Carroll and Pike Counties, bring the total to 11 infected counties. 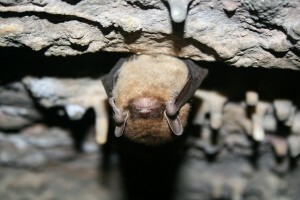 In an effort to try to protect hibernating bats from unintentional human spread of the Pseudogymnoascus destructans, the non-native fungus that causes white-nose syndrome, all Illinois Department of Natural Resources-owned or managed caves have been closed to the public since 2010. In addition, all caves within the Shawnee National Forest, managed by the U.S. Forest Service, have been formally closed since 2009. Winter bat surveys to search for the presence of white-nose syndrome are conducted in collaboration with the University of the Illinois Prairie Research Institute, U.S. Fish and Wildlife Service, U. S. Forest Service, and the Illinois Department of Natural Resources. Since first being in New York State in 2006 and has killed more than an estimated 5.7 million cave-dwelling bats in eastern North America. The latest surveillance shows white-nose syndrome has been confirmed in bats in 26 states and five Canadian provinces.